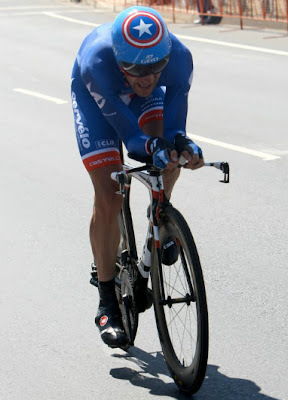 Yesterday in Greenville, South Carolina, David Zabriskie defended his title as the US Time Trial Champion. Earning his 7th title, and the right to wear that Captain Marvel time trial suit of his for another year. Excerpt from RoadCycling.com (read more) ... "Wearing the Stars-and-Stripes does not get old," Zabriskie commented after the finish and added "The last few years I've brought it with me, even though I know I can't wear my Stars-and-Stripes on this day, but I hang it up in my room to remind myself how much I like it and how people want to take it away from me. I enjoy wearing it." 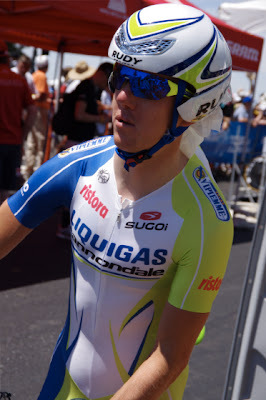 Timmy Duggan is the 2012 USA Cycling Pro Road Champion! We have had three excellent weeks of recent bike racing. Anyone who watched Sylvain Georges solo breakaway ride on Stage 6 of the Amgen Tour of California, and then saw Thomas de Gendt's incredible breakaway ride up Passo de Stelvio in Italy during the Giro last Saturday, and then today watched Timmy Duggan stay away at the front of the laps at the US Road Championships could not be disappointed or assume that the solo ride always gets caught shortly before the line. These men proved that the chasing group does not always catch the breakaway rider. I love to see a ride go for it, and not look back!